(CNN) -- Seven leaders of Iran's Baha'i minority went on trial in Tehran Tuesday accused of spying for Israel, a charge their supporters say is motivated by religious discrimination. The seven -- two women and five men -- are also accused of spreading propaganda against the Islamic republic and committing religious offenses, charges that can carry the death penalty. "We understand that no observers were allowed in the court," said Diane Ala'i, the Baha'i International Community's representative to the United Nations in Geneva, Switzerland. "We understand that even the lawyers had to argue their way inside the court -- lawyers who, in any case, had virtually no access to the accused for nearly two years." At the same time, interrogators from the intelligence ministry and a film crew were seen going into the courtroom, Ala'i said. "We find this completely outrageous, given that these seven have been held purely because of their religious beliefs, in total contradiction to any human rights standards," she said. 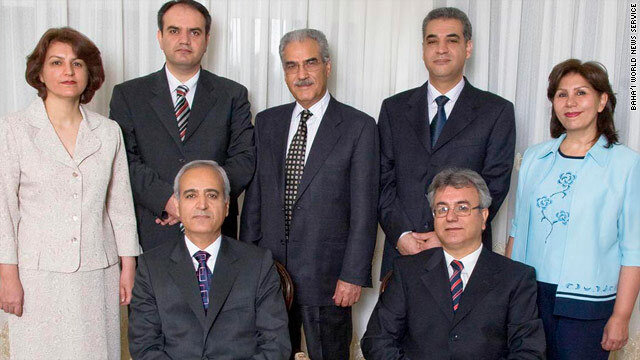 They have been held at Tehran's Evin prison since their arrests in March and May 2008. Their trial was delayed twice. Ala'i said it was because the Iranian regime had no basis for a case. The U.S. State Department on Monday condemned Iran's decision to try the leaders. "Authorities have detained these persons for more than 20 months, without making public any evidence against them and giving them little access to legal counsel," the department said in a statement. Leonard Leo, U.S. Commission on International Religious Freedom chairman, said his group is "extremely concerned about the fate of the seven" -- who risk facing the death penalty. "It appears that the Iranian government has already predetermined the outcome, and is once again using its courts as an instrument of religious persecution in blatant violation of international human rights law," Leo said. "We commend the U.S. government on its strong statement of today and we urge the international community to put the Iranian government on notice that they will be held to account should the sham trial continue this week." USCIRF is an independent, bipartisan U.S. federal government commission that reviews information about violations of religious freedom across the world and makes policy recommendations to the president, the secretary of state and Congress. The Baha'i faith originated in 19th century Persia, but the constitution of today's Islamic republic does not recognize it as a religion and considers followers as apostates.